1. Soak a handful of almonds overnight (or for 12 hours), drain and rinse. 3. Whizz up for 2-3 minutes. Option1: add ½ an avocado and a chopped apple. Blend until creamy. Sweeten to taste (1 tsp raw honey) Makes 1 large glass. 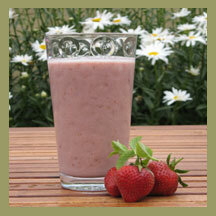 (This makes a good base smoothie which is lovely on it’s own or you can add extra fruit as for option 2.) Option2: add a banana and summer strawberries, raspberries and or blueberries (if you can’t get fresh, you can use organic frozen berries). Blend for a further minute. Add up to 1 more cup water to thin to desired consistency. Makes 2 large glasses. I share many other recipes at my Cookery Workshops and there are others available in the Client Area of this website.